Le Tarot dit "de Charles VI"
Re: Le Tarot dit "de Charles VI"
It's still strange to use a "5". In English we don't say "In the 1985s", or "in the 1515s". We only use it for whole decades, and I've never heard it in French to use a half decade either. So Thierry means to say that from 1515 to 1519 is when it is first attested in Florence and Prato? So "within" the 1515 's. I want to put them as early as possible, at least 1450, based on Apollonio's cassoni productions. But I believe that Charles VI and Catania were made by the same workshop, certainly, and represent the standard luxury production of that atelier in Florence. I imagine this is the kind of pack Giusto Giusti commissioned for Sigismondo Malatesta. I continue to hesitate on any Florentine deck's dating, outside of the period during the papal-backed Pazzi conspiracy, that would include a Death trump featuring the slain pope and curial members, while the pope was in Florence (by which criteria, 1440 would be ruled out as well as later papal visits to Florence such as in 1459). 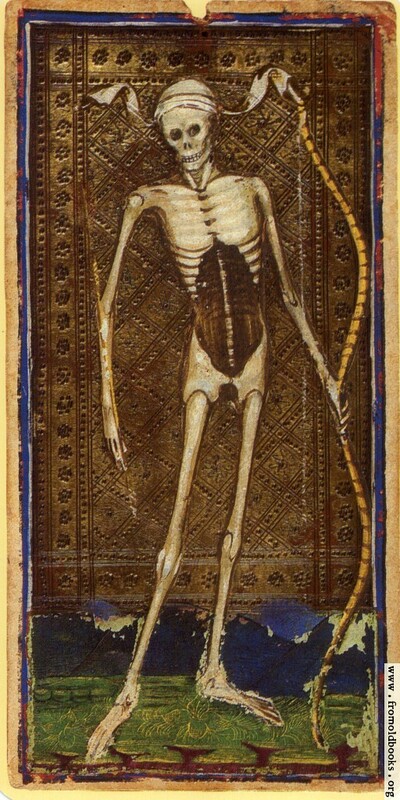 The PMB Death trump ( https://www.fromoldbooks.org/ViscontiSf ... 2x1024.jpg) shows there were alternate ways of depicting the Death trump (as does the corpus of Petrarch trionfi illuminations, such as this one by Lo Scheggia, who did paint tarot cards: https://i.pinimg.com/236x/f5/83/e7/f583 ... ovanni.jpg - and note the black shield such as we find on the CVI Page of Swords, which I argue commemorates the slain Giuliano de' Medici). Having said that, if the concentric version of the Medici 7 palle on the CVI in any way informs your dating proposal, I came across this early version today - from the ceiling of the San Marco Library, completed in 1444, so no later than that (i.e., allowing for any early date). I don't know now. Of course the linguee.fr examples, and all others I can find, use it for whole decades. I wonder if it is not a typo for "dès années 1510" - "the 1510s", or "the teens". Mistakes due to dittography are common enough. I'll have to ask him to explain it. I hate bothering him about really small things, but this seems worth clearing up. I continue to hesitate on any Florentine deck's dating, outside of the period during the papal-backed Pazzi conspiracy, that would include a Death trump featuring the slain pope and curial members, while the pope was in Florence (by which criteria, 1440 would be ruled out as well as later papal visits to Florence such as in 1459). I don't get stuck on those kinds of assumptions. Death came to popes as well, they planned out their monuments. Most triumphs of death showed all of society, from popes and emperors to the lowest commoners, as the point of their message about death equalizing all. I can't imagine any pope took such generic imagery personally. The people who invented it didn't have any qualms about putting a pope in a card game - two in the original form, in my view, along with two emperors - and in the Charles VI at least, showed him anachronistically with a single tiara crown. The Death card shows the same tiara. The "Eastern Pope", the Patriarch of Constantiople Joseph II, had actually died suddenly in the city, during the Council. But in general, it was the very presence of a pope, in so degrading a thing as a card game, that gave moralists offence. So, besides the fact the game was not intended for the clerical class, let alone the highest levels, the idea that depicting a dead pope might cause offence to a resident pope in the city doesn't even occur to me. The 7 palle don't have much weight in my considerations on dating. I took them only as additional nods to a Florentine provenance, during the Medici signory. The hourglass motif was more decisive; per Cohen's studies, it should only appear after 1450. That said, thank you very much for finding such an exquisite early example of the simple design! For me, the figure of the charioteer is a generic one, like those that Florentines would have been familiar with in the San Giovanni parades, or the occasional Magi ones. Often the personage was King David. But not everyone would have known that, and most of the trump painters and designers didn't either - especially outside of Florence. He's just a generic triumphator, albeit in this case one which might have borne some indication of Medici patronage of the parades. Thierry discusses Germini/Minchiate on pp. 34-35 of his 2013 book, Le Tarot révélé. He puts the invention in the early 16th century, with an apparent terminus ante quem of 1515. He doesn't cite the evidence, and I can't recall the documentation for the Germini beginning on this date. I'll try to find out. "Florence and Prato appear to be the first its first home, from the year 1515". In the final clause above, he writes "dès les années 1515", a locution I'm not familiar with. Normally "les années" means "the years", as in "les années 1980", which means "the 1980s". So literally "dès les années 1515" would be "from the 1515s", which makes little sense to me, unless it means something like "in the years 1515 and later". But the evidence will clear up the meaning, when we get it. Thanks for checking in Le Tarot Revele, Ross. I don't know why that didn't occur to me. 1553. Pietro Aretino, "I Germini", Best discussion, Pratesi at http://trionfi.com/tarot-florence-xvi-century (1988, in English. 1543, Aretino in Carte Parlante, same as previous. Game not named, but cards are obviously those of mnchiate. 1517, Germini, Franco-Lothar (Huck): http://trionfi.com/germini-1517-1519. (published 2012, in English). As far as when minchiate was invented, it was permissible to ignore the mentions from 1466 to 1477 as long as the next known reference was Aretino in 1543, because of the long gap with nothing in between, time enough for the two sets of mentions to refer to two unrelated games. But this is no longer the case, as Pratesi has argued, because of the 1506 and 1517 mentions discovered since, narrowing the gaps considerably. As for the two names "Germini" and "Minchaite", there is enough description attached to some of their later appearances (throughout the 16th and 17th century) to make it clear that they are much the same game., as indeed Pratesi has concluded. So what else is there, by which we could date the ChVI cards? As I mentioned earlier, it would help if we knew when Florence started putting numbers on their printed tarot decks. Then it was no longer necessary to memorize the order, and if someone wanted to place the ChVI cards in order, the numbers would help.. Unfortunately we have no direct evidence for the relevant time and place. The first deck I know of with numbers painted on its trumps is the Sola-Busca, if the c. 1490 dating is accurate (and some have disputed it). There are also the Budapest/Metropolitan, of uncertain date, and the Leber. These are all Ferrarese-inspired. Of more Florentine influence is the Rosenwald, of Perugia probably printed within a few years after 1507, since the paper used as filling inside the sheet is from that year and place, as Pratesi has shown. Despite this evidence, we still don't know when numbers started being used in Florence, unfortunately, or how long it would take an owner to mar the cards so as to put those numbers on the cards. Another clue might arise if we assume that someone in the Medici family was the original owner. When would a Medici do such a thing to their heirloom, or when would they be likely to sell to someone who would? It seems to me that a Medici wouldn't, considering it art, and the time for a sale would be at the time of their expulsion from Florence, 1494, or at least sometime before their return in 1512. The numbers would likely be added by the next owner, I would think fairly soon. The result is much the same as Ross's, but with different assumptions, and if anything slightly earlier than his date-range. I hope people will tell me any flaws in my reasoning or facts I have not taken into consideration. These of course are just reasonable assumptions, not proof of any kind. Thanks for the summary references, Mike. 1506 is solid for me, then, for Germini. It is distinguished explicitly from Trionfi. Franco's 1990 article with the 1477 documentation of "il giuocho delle minchiate" I had not seen. Since "il giuocho de triomphi" is mentioned as well among the permitted games, by the same logic I have to admit that the card game "minchiate" also existed at that time. But is it the same as we commonly know? And why was it renamed Germini later, then? There seems nothing, in principle, against the hugely extended trump sequence being invented so soon after standard Trionfi. After all, John of Rheinfelden attests to many variants of playing cards in his neighborhood, within a decade or so of the introduction of cards into Europe. So, some genius in Florence may have looked at the standard Trionfi trumps and had the same reaction people have had since Court de Gébelin to the regular trumps - where is Prudence? But he also wondered why more standard symbols weren't included, like the Theological Virtues, the Elements, and the Zodiac signs. It may have also been an effort to outdo the Trionfi inventor. And he may have done this shockingly early, by our standards. The argument "too soon" isn't very strong. And the dearth of evidence may be explained by the game being restricted to Florence for a long time, and not being very popular. Similarly, that there are no surviving Minchiate trumps from this early period may be because of its very limited circulation for the first 50-60 years. It was a "sleeper", and very expensive to make if the demand did not merit it, compared to the already popular, well-established standard Trionfi, at least until the 16th century. On Pulci in 1466, I don't really know what to think. It could be our game, maybe they invented it, or helped invent it. There is the old story that Michelangelo invented it to teach children mathematics, but given the evidence he would be too late. Name change of games was quite common according Schreiber. I remember the explaining argument, that local game prohibitions stimulated new names for old games (possibly not from Schreiber) . Tarot-Tarocchi was a new name for an old game. It cannot be excluded, that many games had more than one name. In sport we have the curious condition, that soccer is the expression for Fußball, not Football. With Germini in 1506 we have the condition, that it followed the Savonarola card prohibition of 1497. Savonarolism wasn't dead in 1498 in Florence. When Capistranus had caused playing card burnings in German cities in the 1450s, playing card production in Nuremberg needed some years to return to business as usual. The new name Germini (1506) appears short after the new name Tarocchi-Taraux (1505), possibly there is a context. The radical political change of the time in Italy was "France in Milan"(1500-1522 with an interruption) and "Spain in Naples" (1504-1714), both together mean a lot of foreign language in Italy. It's quite common, that new expressions and language changes occur in the context of such big changes. A lot of French and Spanish persons had met Italians, a lot of communicative problems had to be solved. Jacques de Pazzi, Consul of Avignon 1452 and 1458, member of Crescent Order of King René and the chief of the Pazzi conspiration against the Medicis would be the same person. He was said to be in Florence a "gambler"
Could Jacques de PAZZI and Jacoppo PAZZI refer to the same person? Of course, that's the same man. Jacopo de Pazzi had a political function in Marseille in 1459, 1462 and 1464, and he likely was back after this time in Florence. Possibly a Pazzi bank still existed in Avignon in 1476? As pope Sixtus cooperated with the Pazzi bank? Jacopo Pazzi was already rather old in 1478, 57 years. "Having said that, if the concentric version of the Medici 7 palle on the CVI in any way informs your dating proposal, I came across this early version today - from the ceiling of the San Marco Library, completed in 1444, so no later than that (i.e., allowing for any early date)." It would be the earliest we know of. "Seven palle were part of Pierro's personal impressa before the death of his father cosimo, that is, its use, "
"If I remember correctly, the Medici parted their work in the manner, that Piero cared more for cultural matters, Giovanni for the banque and Cosimo for politic. If Piero then made the suggestion, that for the cultural appearance of the Medici the use of impresa and other symbolic signs would be useful, then this was his role in the family, as it was also his role to care for the Riccardi chapel. And his wife Lucretia helped and engaged for literature and the poets." Piero di Cosimo de' Medici got this role by the death of his uncle Lorenzo di Giovanni de' Medici (c. 1395 - 23 September 1440), Cosimo's younger brother, who had a similar function in the period before. One of the first activities of Piero was his engagement for an illustrated Trionfi poem edition from Matteo de' Pasti. Cosme and the Palais Medicis - Riccardi 1445 - ? I don't get stuck on those kinds of assumptions. Death came to popes as well, they planned out their monuments. 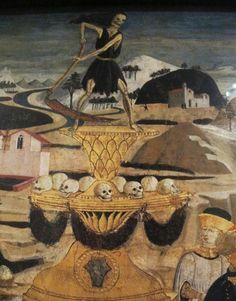 Most triumphs of death showed all of society, from popes and emperors to the lowest commoners, as the point of their message about death equalizing all. I can't imagine any pope took such generic imagery personally.....So, besides the fact the game was not intended for the clerical class, let alone the highest levels, the idea that depicting a dead pope might cause offence to a resident pope in the city doesn't even occur to me. A minor counterpoint , but Pratesi has already connected a provincial member of the clerical class to card-playing at an early date (http://trionfi.com/evx-arezzo-playing-cards). More importantly, the humanist members of the curia, including those who would even go on to become pope (such as Aeneas Sylvius Piccolomini, who penned the bawdy Historia de duobus amantibus in 1444), were not necessarily adverse to a novel and fashionable (i.e., expensive hand-painted decks) means of passing the time, especially as they easily mixed with the humanists in Florence when in residence there. Ignorance of tarot, intended for clerics or not (but note the tondo – ace of coins? - of the cardinal on the Rosenthal “Colleoni deck”), and the well-traveled papal court of the middle half of the 15th century seems unlikely in the extreme. It seems to me that your preference for a possible 1439 Florentine date, as tied to the Church Council, is precisely because of this Patriarch (or rather firsthand knowledge of an "Eastern Pope", by the presence of this Patriarch) and that the Tarocchino Bolognese deck's "Papi" reflects the Florentine ur-order/trumps, ergo the proof (which puts the burden of proof of a "Popess" on Milan, something I'm actually in agreement with). Hence one civic ruler or “Emperor” (with an Empress of course - Giovanni II Bentivoglio, tyrant of Bologna from 1463 until 1506, married his cousin and previous ruler Sante's widow, Ginerva Sforza in 1464, thus she was a "two time empress", reigning from 1454 through 1507); but what of two popes, which you link to the Roman and Orthodox Churches? The somewhat spurious Union (repudiated by its Greek signatories) was of course an immediate failure back in Constantinople, so unless the ur-Tarot was based on the Union, the Council is unlikely to have been the reason for tarot's creation. But was there a later reason in Bologna to entertain the idea of two popes due to its own local history, with no recourse to the Council of Florence? The above quote from Hankins by itself is not satisfactory, but the full career of Bessarion must be taken into account. For the converted Cardinal Bessarion was not only Nicholas V’s papal legate sent to govern Bologna from 1450-1455, but was subsequently elevated to being the Latin Patriarch of Constantinople in 1463, a title he kept until his death in 1472 (and in a sense he was the Byzantine “pope” since Constantinople had fallen to the Turks). Surely Bologna would have looked on Bessarion’s subsequent success with civic pride given his fairly long five year office in their city. Given the 1464 wedding date of Giovanni II Bentivoglio/Ginerva Sforza, preceded by Bessarion's elevation the year before to the Latin Patriarch of Constantinople, we have a year that leaps out at us - 1464 - for cause of special celebration and the creation of something like Tarocchino Bolognese (and note the papal action in the year of the wedding in 1464, when Giovanni II Bentivoglio obtained from Pope Paul II - with special pleading through Bessarion?- the privilege to be considered perpetual head of the city's Senate; again, figurative "Emperor".). It should also be noted that there was an Ecumenical Patriarchate of Constantinople, in "Constantinople"/Istanbul, but that position couldn’t help but regarded with suspicion as the position was appointed by Mehmed II in 1454 as a means of controlling the city and environs after he conquered it in 1453 (the calls for crusades to retake the city were unending in the West and a puppet Orthodox leader, Gennadios II Scholarios in this case, was simply an annoyance, thus the more important role in the West of an “Orthodox Pope” in the office of Latin Patriarch of Constantinople, that was pro-crusade). Thus there is no need to explain the Bolognese "Papi" by way of the Council of Florence (and a supposed ur-tarot connection to it). I'd like to address your take on the San Giovanni procession's influence on trionfi in your other 1457/Sforza/trionfo post (still working on my long-winded reply).